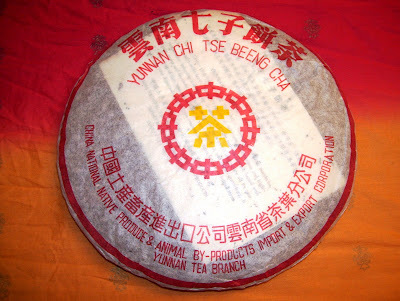 Tsi Chi Beeng Cha or "Seven Son Tea Cakes" are products of the China National Native Produce & Animal By-Products Import & Export Corporation (CNNP). The name Seven Son was chosen by the CNNP as a symbol of good luck and prosperity as both are considered to be lucky in the Chinese culture. CNNP products are unique products with a a rich and fascinating history which deserves anyones' attention. There are numerous factories and styles that will give any collector lots to maul over. This particular ripe example was produced by the KunMing Branch of CNNP National Factories under the auspices of the Chinese Government. The tea leaves were harvested from the Simao area, whose leaves generally tend to be a bit more robust in flavor than other growing areas. The beengs smelled very rich and malty. The leaves were loosely pressed and it appears to have a considerable about of gold buds; very luxurious. 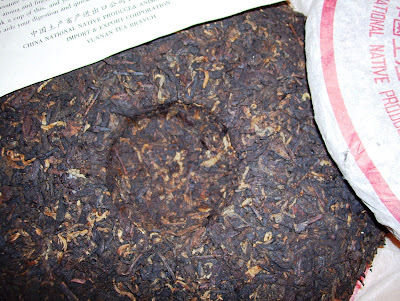 Source - Awoono-Puerh (Ebay Vendor) Awoono-Pu-erh is relatively a new vendor. She is a great communicator and does have lots of interesting products. She is orginally from Simao and now is located in Vancouver Canada. I decided to go with 5.5 gm instead of the 5gm that I usually use for 150 ml. I generally tend to use this amount when the example's leaves can be easily broken off. 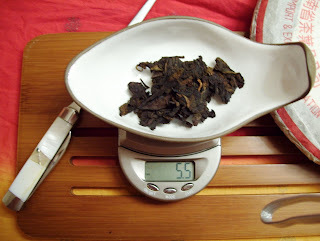 It is in my opinion that loosely packed pu-erh will lose more of its aroma and essence over time as it is less dense. CNNP products are very consistant and this example is no exception. However, since the beeng had been aging in "dry storage" in KunMing for 5 years, you can definitely taste the difference when compared to younger ripe pu-erhs. I think that Simao leaves are great for ripe pu-erh, and IMHO, produce ripe pu-erh which generally tends to be more complex and quite flavorful. Its aroma was quite captivating which consisted of subdued honey, woody and chocolate notes. The infusions which lasted 5 rounds. All had layers of chocolate and malt with its subsequent brews being laced in black pepper and currants. It was a rich, sweet, velvety brew with a throat pleasing viscosity. Well, what can you really say about ripe leaves. However, the leaves do seem to have keeped some of its integrity. From my tasting notes you can probably assume that I enjoyed this product very much. It was much more velvety and smooth than what I thought it would be. 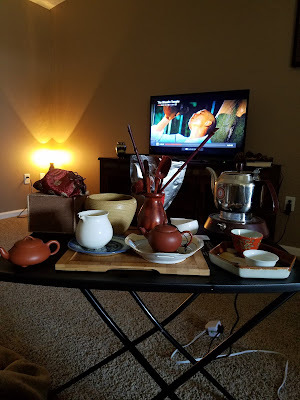 I haven't enjoyed a ripe pu-erh session in quite a while. Great find! Nice post, Bill, thanks for introducing us to this tea and to this vendor in Canada. I've just started to discover what a pleasure ripe puerh can be. I'd say the good ones have more in common with a rich mocha coffee than with most other teas. And -- as far as I can tell -- they have pretty much nothing in common with sheng, either young or aged! Unfortunately, there are so many mediocre or bad ones out there that guidance in buying is always appreciated. Thanks also, Bill. I'm keen to check out this new vendor, and this looks like a great place to start. 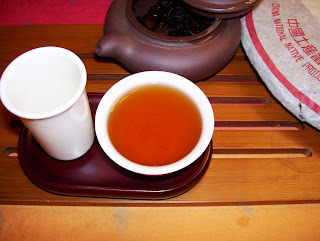 A number of us rather enjoyed the 2006 Haiwan "tea king" shupu brick from YS, too. Most of his products I have never heard of. However, reading the comments, it seems most are quite pleased. Thanks for the tip Hobbes! 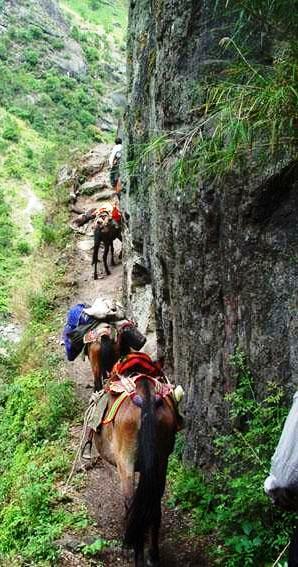 I will have to checkout the Haiwan brick. And to you both, thanks for reading!!! I appreciate your blog and pictures since the beginning. I add you to my favorite tea links. Long live to your very nice blog and don't hesitate to write some comments on mine. It is a luxurious looking tea, isn't it? I'm glad to see you reviewing a product from Awoono. 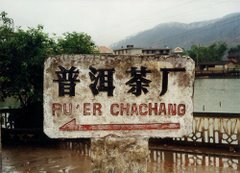 I've seen links to them on a few good puerh sites, but no one has really written anything about them. I'm glad you've had a good experience. Thanks for the kuddos Mary! You have made my day. I try to do as much research as possible. 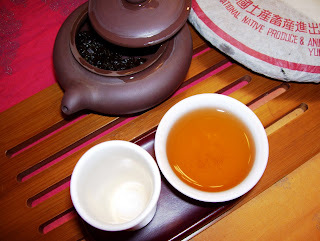 Hopefully it gives the reader a bit more context of the pu-erh being reviewed. 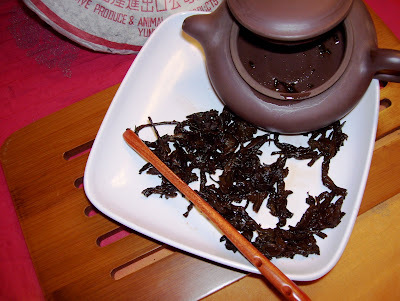 To me pu-erh has become more than just tea. It's drinking history! You just got to love this stuff! And here I am, researching the sample you sent to me, lol.